The Cyclone Control Suite offers multiple means of controlling gang programming operations. The Cyclone Control Console is a scriptable command-line utility which makes gang programming extremely easy to set up and run. The Cyclone Control SDK is based around a dynamically linked library (DLL or SO) and allows detailed gang programming control from many tools, languages, and environments on the host PC. The same image can be launched on multiple Cyclones simultaneously simply by specifying multiple Cyclones on the command-line. If different image sets exist on each Cyclone, using condensed image descriptions is a good way to guarantee the appropriate programming image is launched. If the image set on each Cyclone is the same, the image number will match, and as such the image number is another way to launch the same image on multiple Cyclones. 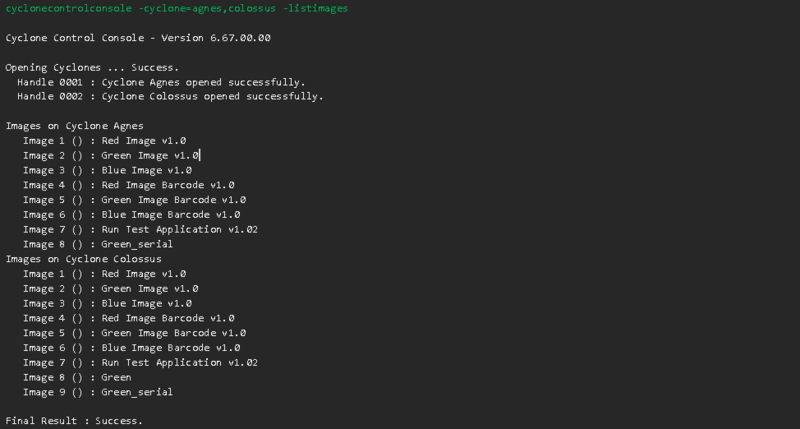 The following example launches the "Green Image v1.0" programming image on three different Cyclones simultaneously. The Cyclones are referenced by name (Agnes, Colossus, HAL9000) and the image is referenced by the condensed image description "GreenImagev1.0"). In addition to programming the data that's included as part of a programming image, additional data can also be programmed into each target device. This "dynamic" data can be specified each time a programming image is launched, so it can be customized on a target-by-target basis. Dynamic data has many use cases: customer driven serialization, configuration, tracking, date coding, etc. Multiple sets of dynamic data can be specified on the command-line. Data can be provided as an array of bytes or as a null-terminated string. Recovering success/error result from python/bash/batch/etc. In addition to displaying success and error information as strings written to the Console, the Cyclone Control Console also returns an appropriate error code to the operating system on the PC. An application or various scripting languages can be used to test for this error code. A zero error code indicates successful operation, and a non-zero error code indicates a failure. PEmicro’s Cyclone Control SDK provides the developer with a dynamically loadable shared library (DLL or SO), example application code, and supporting documentation to allow custom software applications to directly control the Cyclone. Languages and environments such as C,C++, Delphi, C#, Java, Python, and Labview are supported. Here, the programming operations are started on 3 separate Cyclone units that are connected to the host PC. This will work even if all the Cyclones are connected on a mix of different ports or remotely away from the PC. The program then waits for their completion before proceeding. 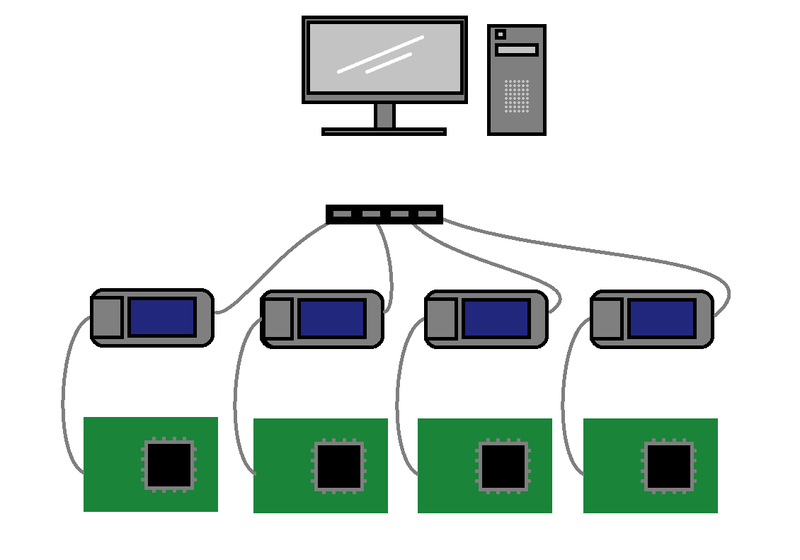 In essence, 3 separate devices are programmed in parallel. Many Cyclone units can be controlled in parallel from a single host PC as the programming work is done on the Cyclones themselves. In the example below a serial number is programmed into each of the targets connected to the three Cyclones. 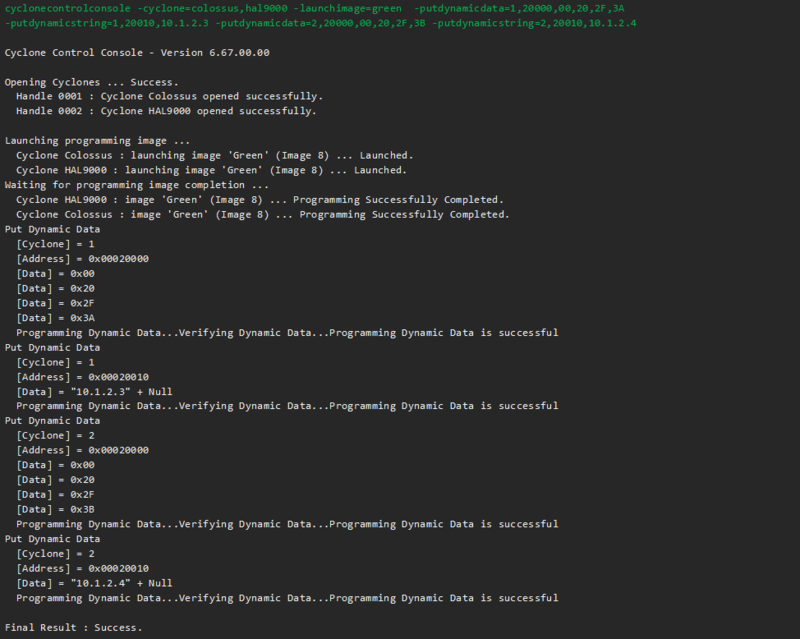 To do this, the code calls the “startDynamicDataProgram” routine. The arguments are the Cyclone handle returned from “connectToCyclone,” the address to be programmed (which is address 0 in this case), the length of the data to be programmed, and a char buffer. 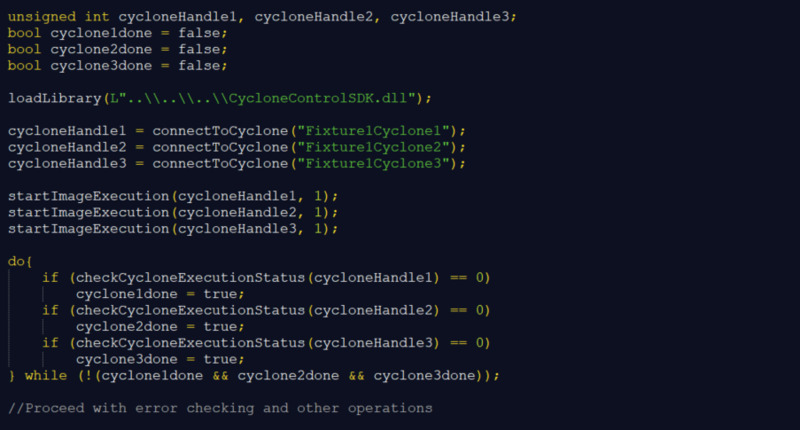 The Cyclone Control SDK gives the user the option to check for errors after the execution of a programming command has finished (indicated when checkCycloneExecutionStatus returns 0). To check for errors, call the “getNumberOfErrors” routine with the Cyclone handle as the lone argument. The return value of this routine is the number of errors in the specified Cyclone. If this value is 0, there were no errors. 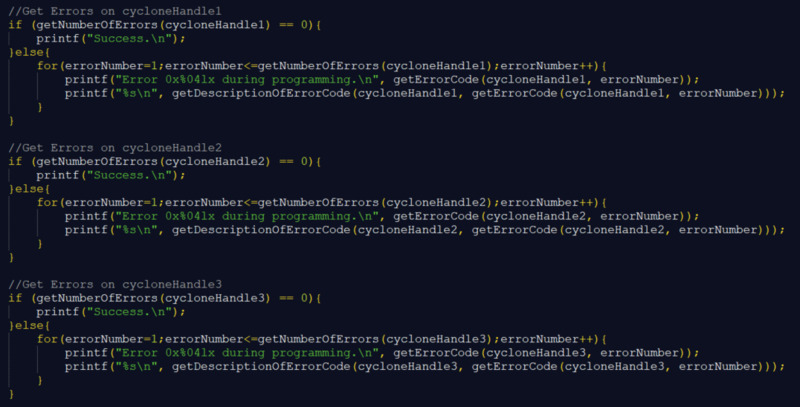 By using the “getErrorCode” function with the Cyclone handle and the error number (1..the number of errors), the user can get the error code number of the error which occured. For more information, the error code and be passed to the “getDescriptionOfErrorCode” routine in the Cyclone Control SDK which returns a detailed text description of the error. It is very easy to create a gang programming setup using PEmicro's Cyclone Control Suite in combination with multiple Cyclones. Since each Cyclone is itself an independently operating programmer, a mix of programming images, targets, and data can be simultaneously programmed into many devices while maintaining a high level of performance. The Cyclone Control Console makes gang programming extremely easy to set up, while the Cyclone Control SDK allows detailed customization of gang programming control from many tools, languages, and environments.